The best thing about these flies is their mating ritual. This whole set up seems to defy gravity - how does he manage to cling on with two legs only whilst mating with a female who is eating another insect? 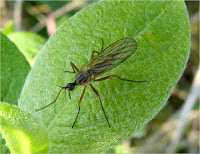 Female dagger flies will only mate with the male if he brings a 'nuptial gift' (i.e. a dead insect) for her to munch on whilst mating. In fact, you can see here that this lucky female was brought a mayfly, which obviously did the trick, as he certainly got his wicked way with her. Only problem was that she seemed to be far more engrossed in the meal than she was in him. Guess the same thing happens in humans, only she has usually finished eating prior to any coital activity. 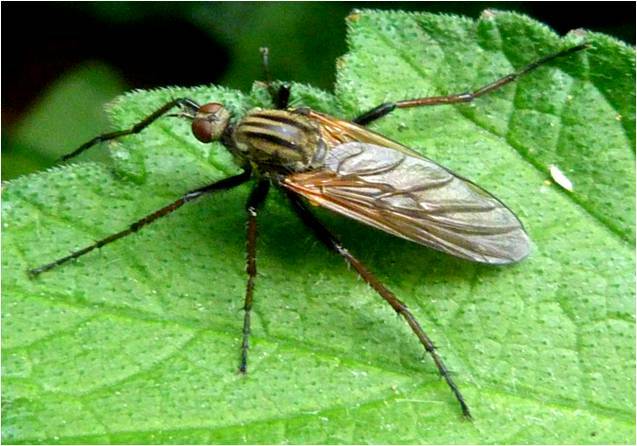 This is a large and quite fearsome looking fly. 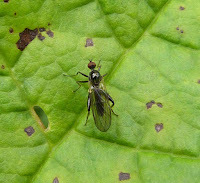 Its long, solid downward-pointing probosis (seen in the photo on the left) is used for spearing other insects. 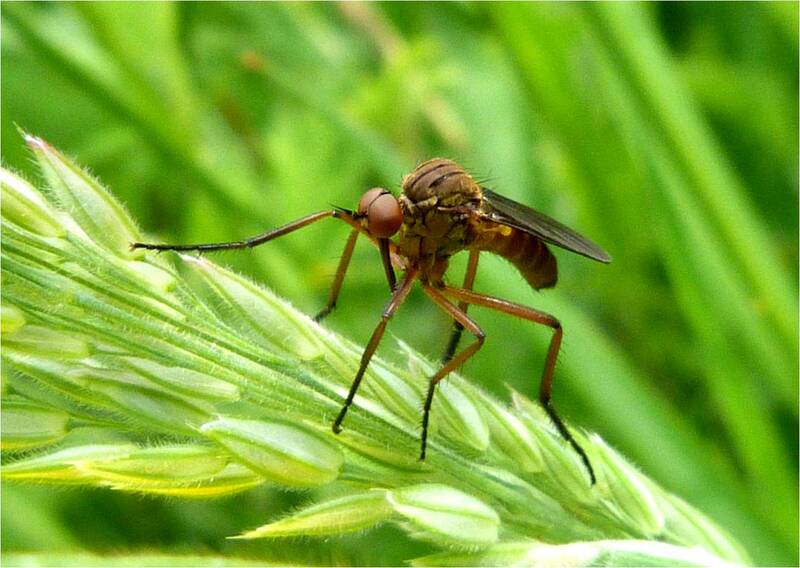 It is also known as a dagger fly because of its probosis. They are often found in flowery habitats and feed on nectar as well as flies. 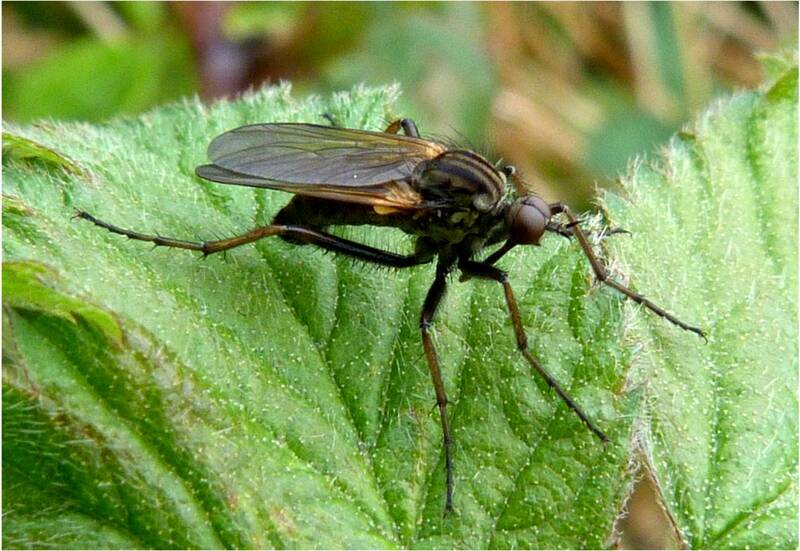 This may be Empis livida, although there are 14 species in this genus. 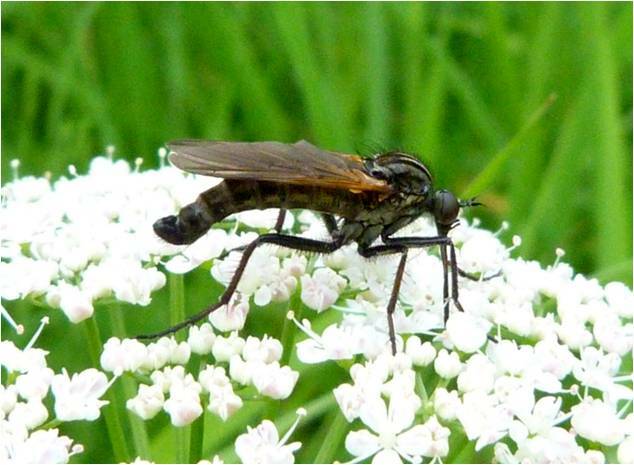 This insect is very like the previous Empis tessellata, but the thighs of the Empis tessellata are black, whilst the thighs of this Epis sp. are red/brown. The male’s wings are slightly cloudy, as in the top photos, whilst the female has clear wings (possibly the bottom photo). This species is less common in Scotland. 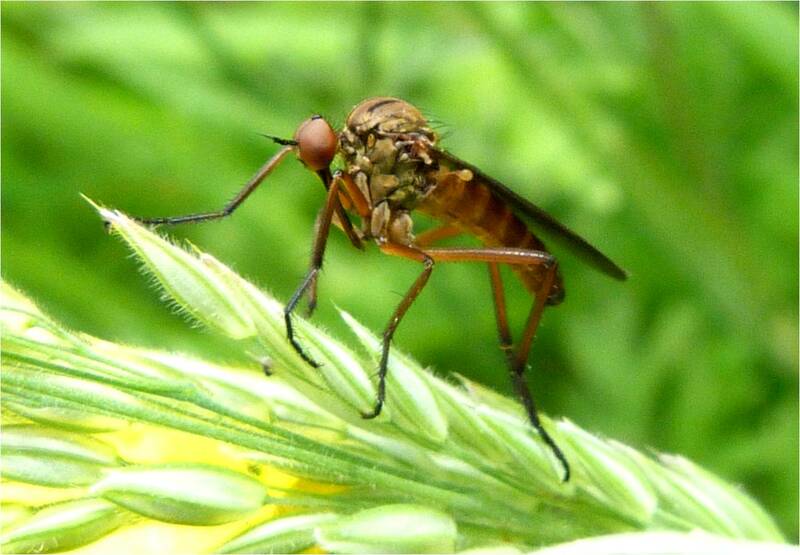 A rather attractive fly. There are a number of orangey-brown dagger flies with stripes running down their back, but this narrow black stripe makes it quite likely to be this species. The bright colouring made it quite conspicuous against the leaf and it has the distinctive dagger-like piercing mouthpart which distinguishes all these daggerflies from other similar looking flies. There are a few Hybos species, so I can't be sure of the identification of this one, but they all have these distinctive large red eyes, which seems to take up their entire head, a very large and rounded shiny thorax, long slim abdomen and legs with thickened spiky 'thighs'. The very tops of the 'thighs' look yellow particularly when looking at the insect from directly above. A surprisingly conspicuous fly given its tiny size. It seems like dance flies and dagger flies used to be classified together, but now they are classified separately - not sure why. 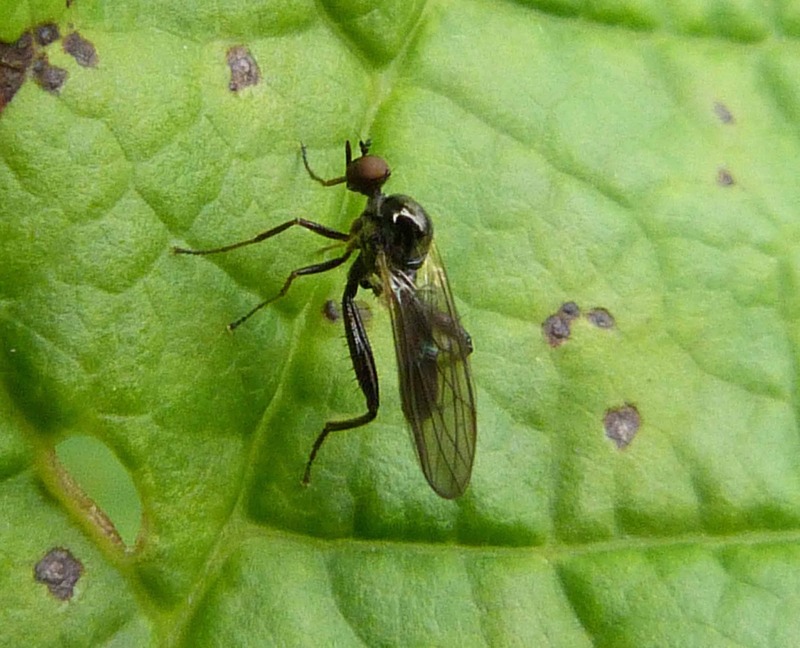 So, whilst all the flies above are dagger flies, this one is a dance fly - seems fairly obvious to tell them apart from what I can tell - dagger flies have a large dagger-like appendage coming from their 'mouths' and dance flies don't. 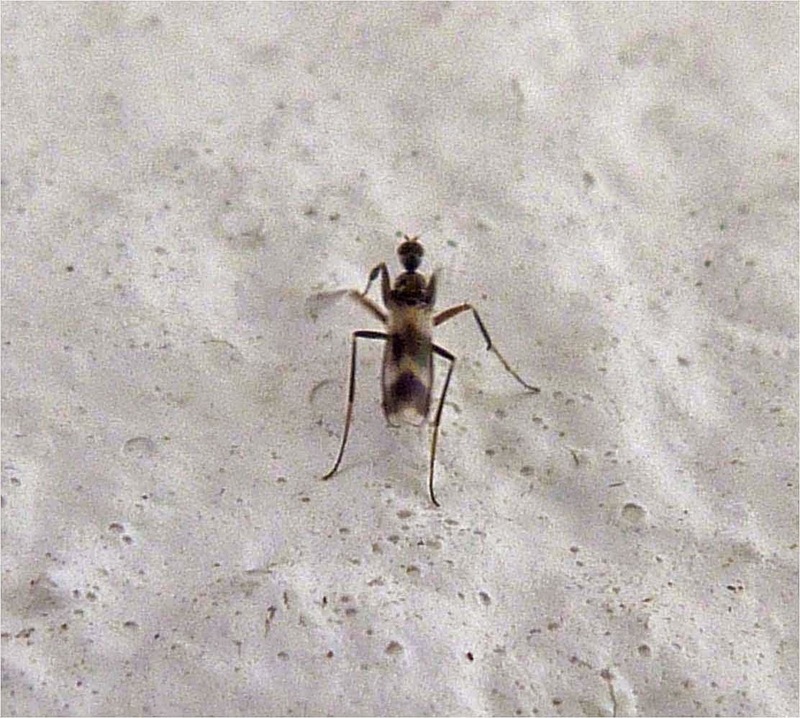 Also worth mentioning that this would have to be microscopically examined to determine the precise species. 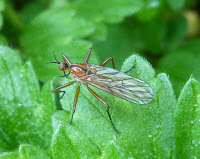 Anyway, the pattern on this dance fly's wings remind me of road chevrons. And interestingly, when I started photographing it, I was sure it was simply going to fly off, but it just crawled up and down the wall and didn't fly off at all - weird. In fact it didn't stop crawling around, which is why, as well as it being pretty small, I couldn't get a sharper photo than this. Still, hopefully there's enough detail here to get the idea.